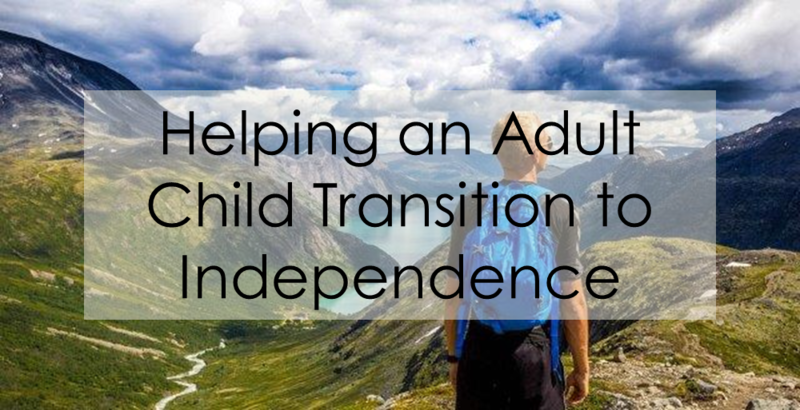 The need for helping an adult child transition to total independence is becoming more and more prevalent in our society. According to the Pew Research Center, the number of adult children (ages 25-35) living with their parents has increased by 5% since 2000, and it’s nearly doubled since 1964. Furthermore, a study conducted by the U.S. Census Bureau found that living with one’s parents is the single most common living arrangement among young adults ages 18-34. A variety of factors are responsible for this shift in societal norms. One such factor seems to be the increase in the age at which people are choosing to get married, assuming they do marry. It’s now estimated that one in four adults will never marry [source]. Other potential factors contributing to this new trend include personal debt, employment concerns, and cost of living. In my personal experience, the marked increase in anxiety disorders and related mental health issues also plays a role, at least for some families. In addition to living at home, many young adults remain financially dependent on their parents, at least in part, for extended periods of time. Click on the images below to read more about the various skill sets a young adult needs to succeed, why these particular skills are important, and how to help young adults develop them.